After our first night camping in the Great Smoky Mountains National Park in July, Husband Walter and I woke up to cool mountain breezes. What a difference from the heat and humidity of the Mississippi Gulf Coast! A focal point was the campfire that hubby kept going. A campfire encourages “just being.” Hubby excels at “just being,” savoring the moment. A previous camper had started burning a section of a downed tree that had an impressive diameter. The result was a fascinating collection of straight lines and concentric circles. 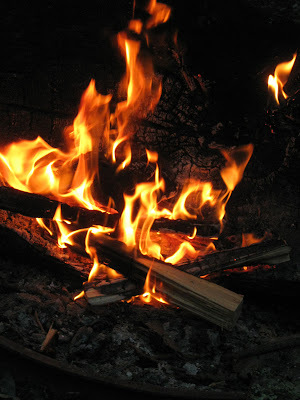 The blackened and cracked backdrop for our fire also helped direct warmth that countered early morning chill. A backdrop enhances our fire pit. Hubby’s coffee pot sits on his “warming rock” in the fire pit. 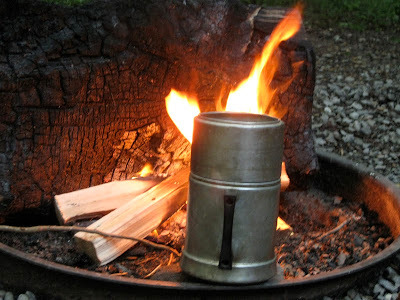 With a cup of hot tea for me and coffee for Walter, we enjoyed our fire and the birds that filled the morning with their vocals. 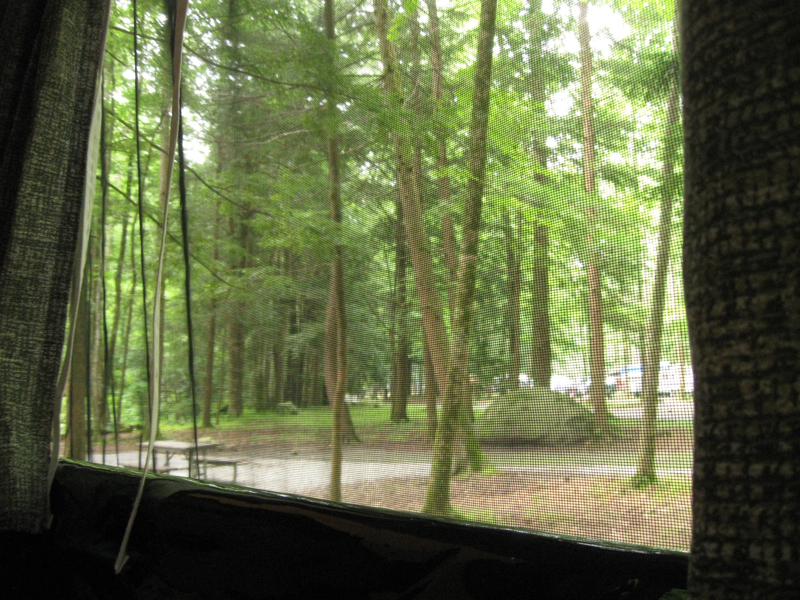 Hearing birds in our campsite is not unusual, but they usually stay near the tops of the tall trees surrounding us, rarely giving us a glimpse. This morning was different. They flitted among the branches before us. They took exuberant morning baths in the edge of a quiet pool that a rain-swollen stream had created at the back of our campsite. There were several species in the avian choir, but my usual drive to identify and learn about each little feathered resident gave way to simple, peaceful and immobile appreciation of life’s abundant gifts. I am getting better at this “just being” thing. 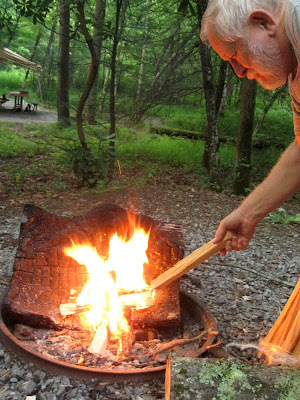 Your photos of the campfire and flames are mesmerizing, and your dh can help you learn to just be. I am having a book give away on my blog today, if you need any reading material on your journeys, take a look. I'm so glad you are having a nice time. Your fire pictures are awesome, too!!! How lovely. I am very good at just being, but David prefers to be active, a doer. Oh I loved camping in the mountains, but have not been able to lure David up there in years. And, we are so close to Sky Line Drive it is almost criminal. a campfire to get lost in, a hot drink to hold and sip--does it get any better? I think not. Enjoy. "Just being" is one of my favorite states! Glad you could relax and enjoy. Staring into the beautiful fire is just mesmerizing. I love your statement about Just Being. Be it the ocean, lake, or a magnificent sunset...they all call for just being. I am really in need of doing just that! Thanks for sharing your vacation with us. 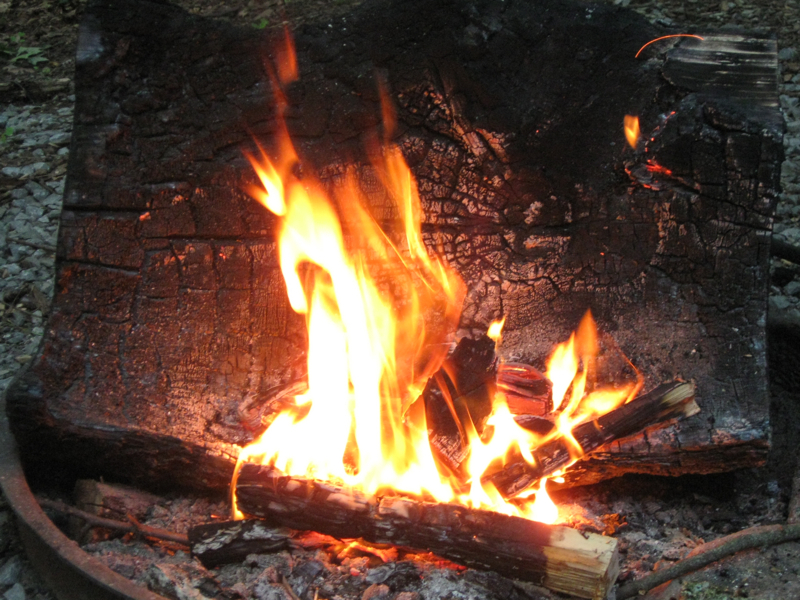 Nothing is more relaxing than a nice campfire! It's one of the things I miss most about camping.